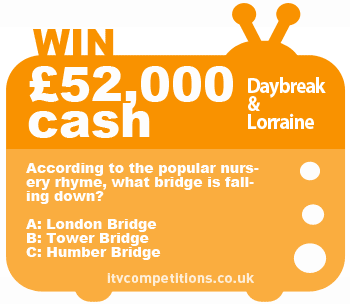 Lorraine & Daybreak competition - win £52,000 cash! Lorraine & Daybreak competition – win £52,000 cash! Competition closes for entries online at 12.00 p.m. on Thursday 17 January 2013. According to the popular nursery rhyme, what bridge is falling down? You can enter the Lorraine & Daybreak competition 6 times per phone number for free via the itv.com competitions form – good luck!